City of Kingston Can and Should Reject the NYS DEC and Thruway Authority Request to Co-Lead SEQR Review for Pilgrim Pipeline Project. Here’s Why and How. UPDATE: Kingston did it! Both the City of Kingston Mayor and Kingston’s Common Council (unanimously) voted to send letters to both the NYS DEC and Thruway Authority. VIEW the letters. On December 21st, the NYS DEC and Thruway Authority both agreed that together, they would become Co-Lead of the SEQR review for the Pilgrim Pipeline Project. Because Involved Agencies have been waiting for some resolution of the disagreement, expressed by 29 towns, cities and counties, with Thruway’s November 21, 2015 proposal that it serve as sole lead agency, some might have thought that the co-lead agreement between DEC and Thruway was final. But it isn’t. It is simply 2 involved agencies making a new proposal for who should serve as lead agency for the environmental review of Pilgrim Pipelines project. SEQR regulations require that all involved agencies be given the opportunity to respond to this new proposal, which they can choose to consent to or reject. 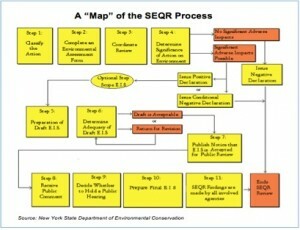 Furthermore, the reasons cited by 29 Involved Agencies that rejected the NY Thruway Authority’s proposal to be Lead Agency in the SEQR process in the first go-round : that Thruway stands to gain monetarily from Pilgrim Pipeline to use their right-of-way and that they are not equipped or experienced in managing an environmental review process for such an incredibly large and complicated project, remain true. The bottom line is that the NY Thruway Authority’s bid to take on the lead agency role was overwhelmingly rejected to begin with and yet they are still in the running. Also perplexing is that on the NYS DEC’s own website, they dissuade co-lead roles in SEQR and instead advise that “a single lead agency be established with the other agency actively involved in the process but not as co-lead agency” and for good reason. What would occur if the two leads differed in opinion somewhere down the line? Which agency would trump the other for a decision to be made?